Walter Herdeg is mostly known for founding Graphis in Switzerland in 1944 which went on to become one of the leading design journals of the postwar years. 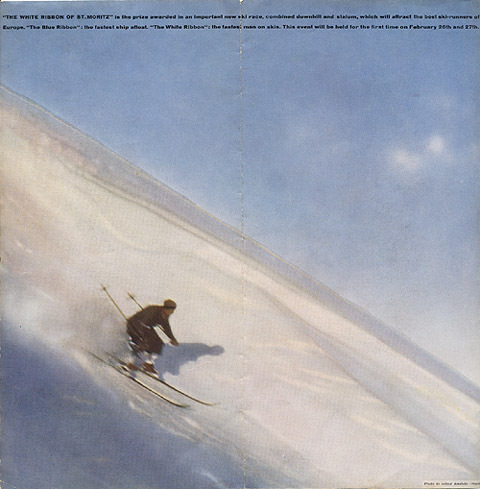 However, buy viagra find Herdeg spent six years from 1932 to 1938 working with Walter Amstutz designing both the advertising and the “corporate identity” for the Swiss ski resort, viagra medical St. Moritz. 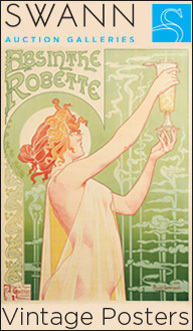 This campaign generated a number of memorable images many of which are popular among poster collectors. 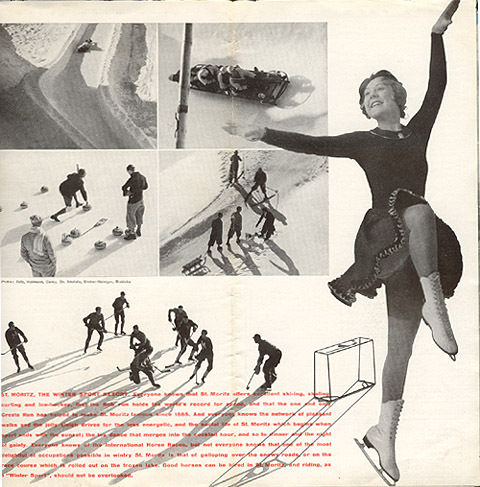 In fact, the logo is still used by St. Moritz today. I focus on brochures and that medium was also well represented in the body of work. I have approximately 10 in my collections. This one is from the campaign for 1935. 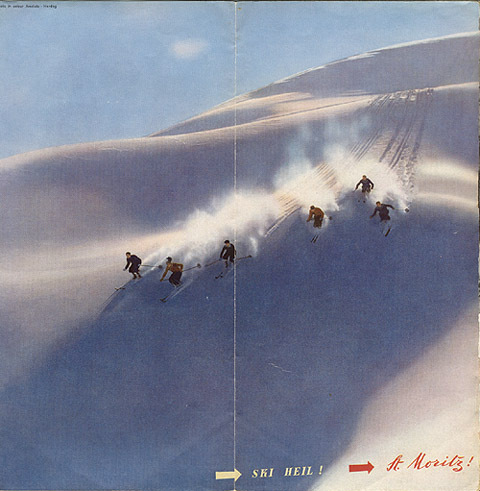 The story of how Herdeg came to create a “corporate identity” for St. Moritz is fascinating. 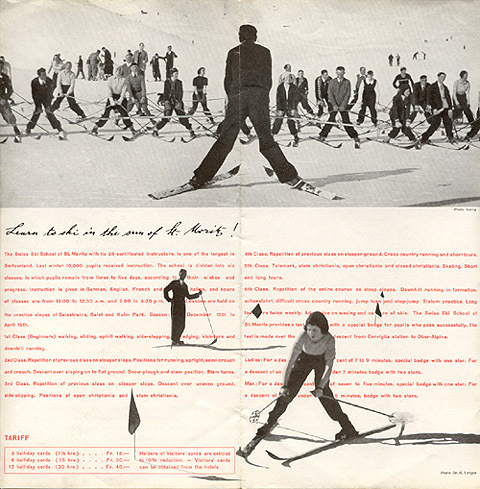 Like many “new” developments, we can see the entrepreneurial development of a style and theme which echoed what other Swiss designers were doing, particularly Herbert Matter work for the Swiss Tourism Office. 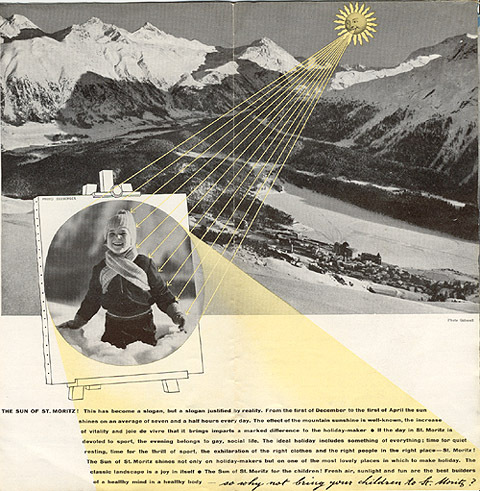 Herdeg and Amstutz mixed graphics – particularly the “shining sun” logo, photomontage, font, and stunning photography, much like what Matter was doing at the time. I do not know if they did meet but it seems highly likely that they Matter and Herdeg influenced each other. The relationship was a designer’s dream, for Amstutz understood the need for good and effective publicity and trusted Herdeg’s tastes implicitly, allowing him to create a unique, if not revolutionary, identity campaign. As Herdeg notes, “I was heading up a corporate design program without knowing that such a thing existed.” Although Peter Behrens had designed a corporate identity for AEG, a German electrical company, two decades before, this was certainly the first time a health resort ever tried to do “corporate design.” Herdeg created a memorable campaign based on a delightful trademark of a brightly shining sun which, to his credit, is till used today. And which he proudly had carved onto a ring that he always wears. Herdeg was influenced by Claude Hopkins, the American publicity genius whose advertising philosophies emphasized the clear articulation of imagery and thus changed the visual tenor of the field. Although Bauhaus had exerted a great influence on contemporary practice, Herdeg eschewed what he believed was the cold rationality of the Bauhaus for a more eclectic approach. “My job,” he states, “was to bring people to St. Moritz. I knew that if I did abstract designs most people would not understand and so would not be motivated. I had to create an atmosphere that gives one the desire to breathe fresh air, soak up warm sun and ski. So I knew I must have color. Today I would use color photography, but in those days it did not exist.” His decision to apply bright colors with an airbrush to his inventive photomontages was concurrent with Herbert Matter’s now iconographic Swiss tourism posters. The six years that Herdeg worked more or less full-time for St. Moritz offered more than just a collection of fine portfolio samples. “The condition of employment,” he recalls happily, “was that I could travel to London, Paris and New York between seasons to work on my own besides making sketches for the various future campaigns.” These lengthy sojourns abroad increased his awareness of international design and thus strengthened his own vision as well. 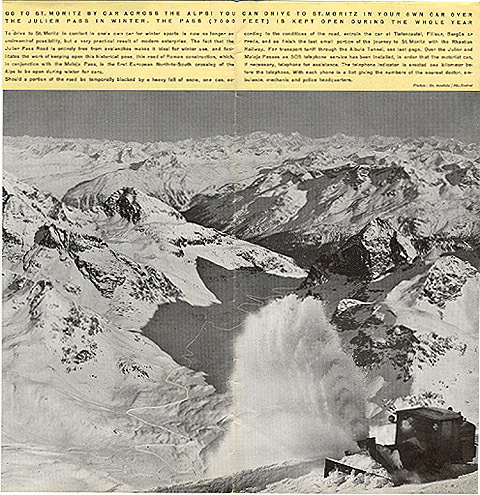 However, by 1938 with the specter of world war rearing again for the second time in 20 years, St. Moritz decided to terminate its long-range, foreign publicity plans, thus ending one career chapter and beginning another for Herdeg.